Despite his wide experience, Wesseltoft explains that this is his first venture into “serious piano trio” – not that the dynamic reach of e.s.t. or this new band can be viewed in a traditional context. Through the 1990s and noughties, Svensson, bassist Berglund and drummer Öström steadily charted a course to increasingly new heights, packing concert halls and influencing a generation of musicians with their experimental approach. The thrill is that, rather than looking back, this new partnership is now using that legacy as a springboard. Wesseltoft has a lively, energetic and different enough character to make his own mark, in conjunction with such a recognisable rhythmic powerhouse, and their on-stage ‘hyperspace’ probes (seen in a recent live concert stream) even tune in to the freer improvisational style of e.s.t.’s final studio albums, Leucocyte and 301. 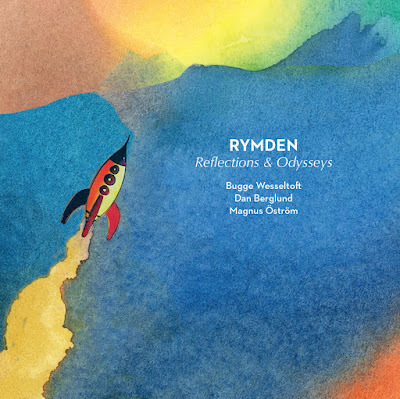 Both Dan and Magnus have continued throughout the intervening years, in solo projects and other guises – but Rymden (translated: ‘outer space’) feels like ‘home’; and all credit and gratitude to Bugge for his exciting, seamless integration. Out of Reflections’ otherworldly echoes, the memorable, rapid-firing rock motifs of The Odyssey evolve into an undulating, thunderous bass-and-drum swell – and Wesseltoft’s flamboyance at the piano is immediately a great fit. But there’s another side to this band as intricate Rhodes grooves in Berglund’s Pitter-Patter hark back to 1970s jazz-rock. Öström’s characteristically-titled The Lugubrious Youth of Lucky Luke clearly displays the shadowy hallmarks of e.s.t.’s more pensive, chorale-like output, his softly-malleted beat a constant thread under acciaccatura-inflected piano and Berglund’s wistful arco melodies. The range of atmospheres created in Wesseltoft’s eight-minute The Celestial Dog and the Funeral Ship is simply beautiful; and chiming Bergen is redolent of Dolores in a Shoestand from 2006. Electronically-manipulated solo percussion in Öström’s The Abyss introduces his rhythmically-challenging Råk, alternating episodes of mire-treading grunge with chasing Rhodes over a drum-bass-synth propulsion reminiscent of Pink Floyd’s On the Run. Wesseltoft’s closing Homegrown seems to weave together Scandinavian folksong with the countrified calm of e.s.t.… and, both subtly and movingly, the trio also ensure that Esbjörn’s spirit remains amongst us. It’s to be hoped that Reflections & Odysseys propels another special and enduring musical relationship. Rymden’s European tour, 21 February to 27 May, includes Manchester’s Stoller Hall on 20 May, with Cheltenham Jazz Festival on 4 May now added.